if forgiveness does not give us calmness, think for another name. once we err, be determined not to repeat. at least, we have the intention to be better even though there is a huge possibility for us to repeat it. that is why, ALLAH has never restricted specific time for us to do taubat. it is a nature but we have our mind and heart. we can think, change, and do something with the flaws occurred in our life. believe me, this is a fact. 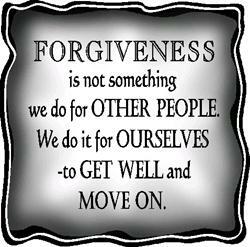 once we forgive, forgive with an open heart that you never want to talk about what had happened anymore. once we forgive, we should never bring things back because the effects will be worse than the first time it happened. At least try to avoid for the same thing to happen so that we can feel that we actually have given a forgiveness with sincerity, no more grudge, no more revenge. everything should be considered fine and back to normal. it is hard but still can be done. ps- ia berasal dengan ikhlas, berakhir dengan ikhlas, kerana hati terluka yang tiada terubat, malah ditabur garam tambah asam limau tak lupa jugak cuka. deng!!!! rasa lega bila dapat memaafkan orang..it put my mind at ease..
buat ape pun kena ikhlas even memaafkan orang..
kecek BI dah plak. haha..
Bagi saya belajar dulu memaafkan orang. Lama-lama ikhlas itu akan hadir. InshaAllah.